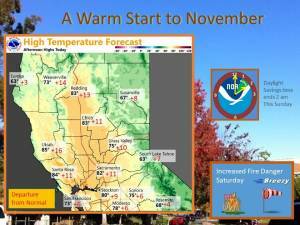 November 1, 2018 – Dry with warmer than normal temperatures through the middle of next week. Breezy north winds may lead to elevated fire weather concerns on Saturday. Upper level high pressure ridge axis will center over the west coast today will bring up daytime highs to between 10 and 15 degrees above normal. Winds will remain northerly but be lighter today as northerly surface pressure gradients relax. Dry conditions continue on Friday but daytime temperatures level off as a weak shortwave trough flattens the west coast ridge as it treks through the Pacific northwest. Impacts from this system will be minimal but some high cloud cover is likely. A bigger impact is expected on Saturday as surface high pressure nosing into the Pacific Northwest produces another tight northerly gradient across the north state. The GFS shows about a 10 mb gradient from MFR to SAC and with some upper level support expecting another round of breezy north winds starting late Friday night and lasting through Sunday morning. The breezy north winds and warming temperatures with bring lowering humidity on Saturday. Minimum RH values are forecast to drop into the teens which combined with the winds will bring increased fire concerns yet again. Winds drop off on Sunday as another shortwave trough passes through the Pacific Northwest. This system will bring some cloud cover and cooler temperatures to the forecast area but daytime highs will still remain well above normal. 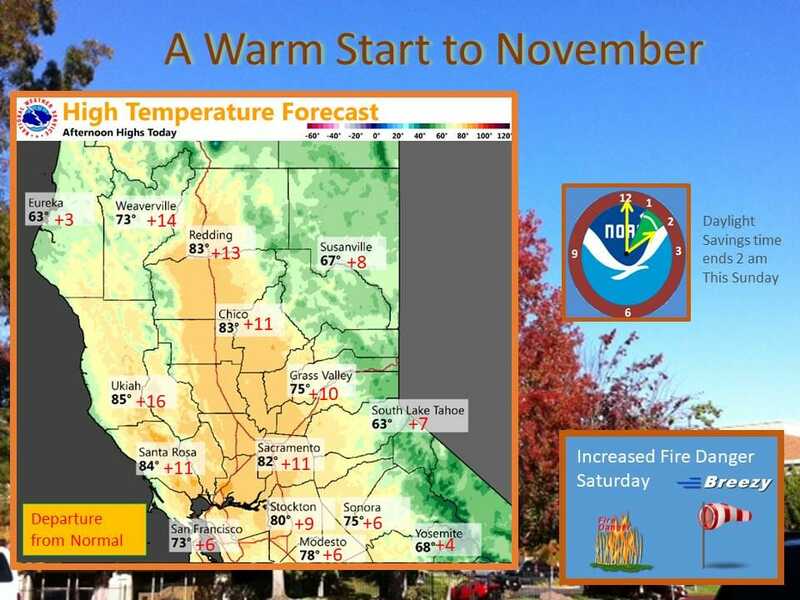 Dry weather with mild days and cool nights next week as high pressure remains over the region. Locally breezy northerly winds will be possible at times.